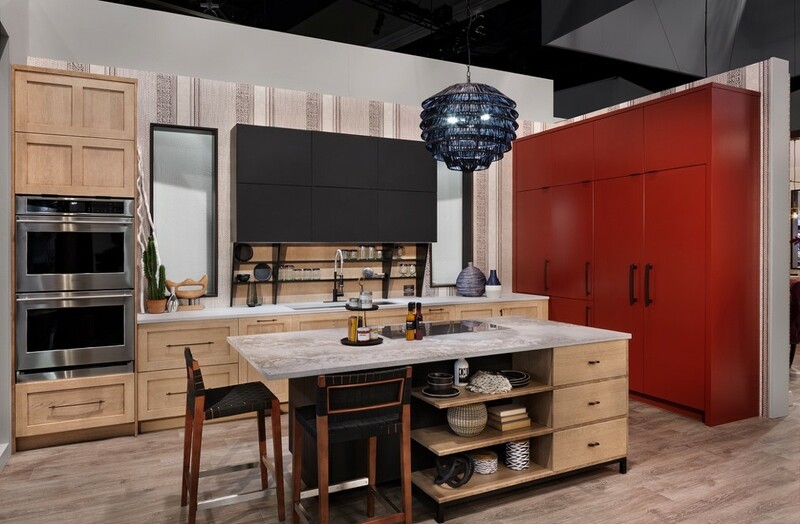 Hot trends in kitchen and bath design were on display at this year’s Kitchen & Bath Industry Show (KBIS), North America’s largest trade show dedicated to kitchen and bath design. 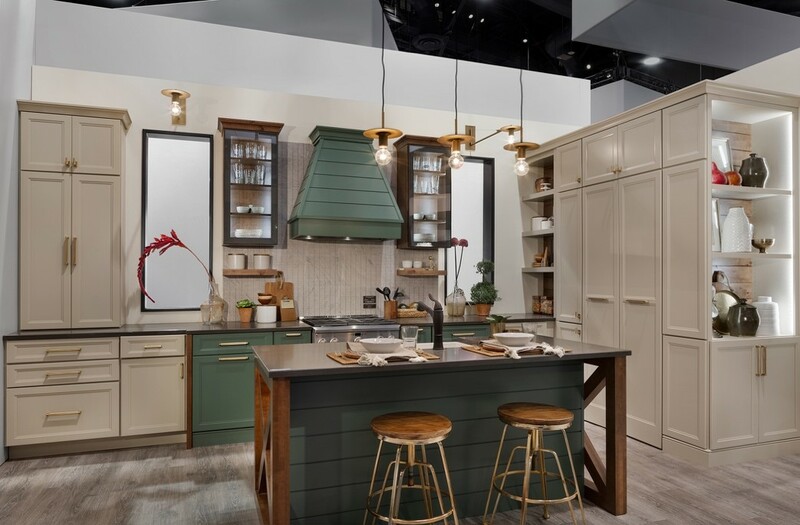 Over 600 exhibitors showcased their latest product lines, incorporating the new colors, materials, finishes and details impacting design today. 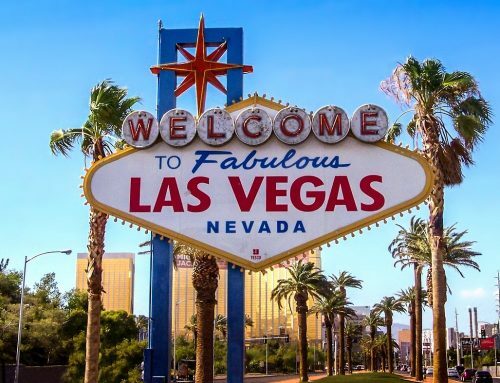 Here’s a quick recap of what was trending at KBIS 2019. While neutral has been a trend for some time, color is making a splash in kitchen and bath designs. Medallion’s Yorktowne modern farmhouse kitchen used deep muted green cabinetry combined with ivory perimeter cabinets and glass accent doors to create a warm ambience. 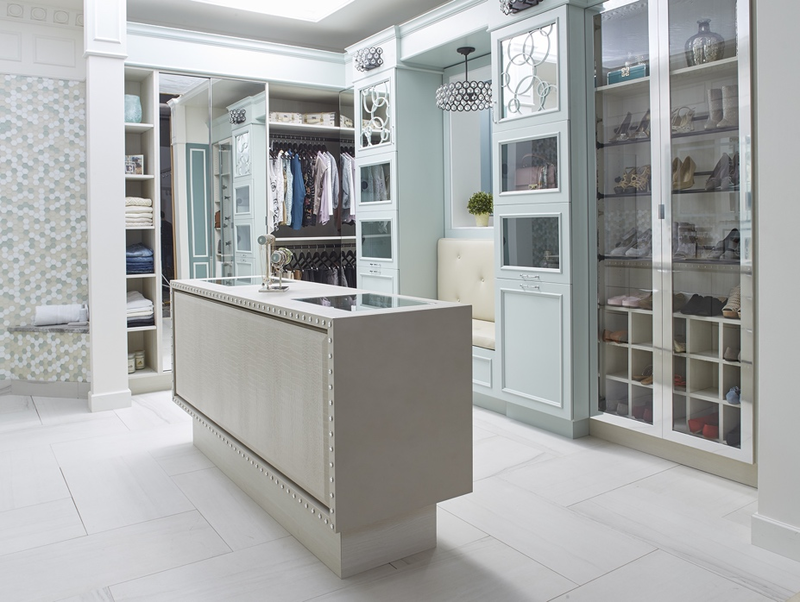 Wellborn Cabinets’ luxury closet incorporated pale mint cabinetry, leather surfaces and chrome and glass doors to create a luxurious boutique style space. 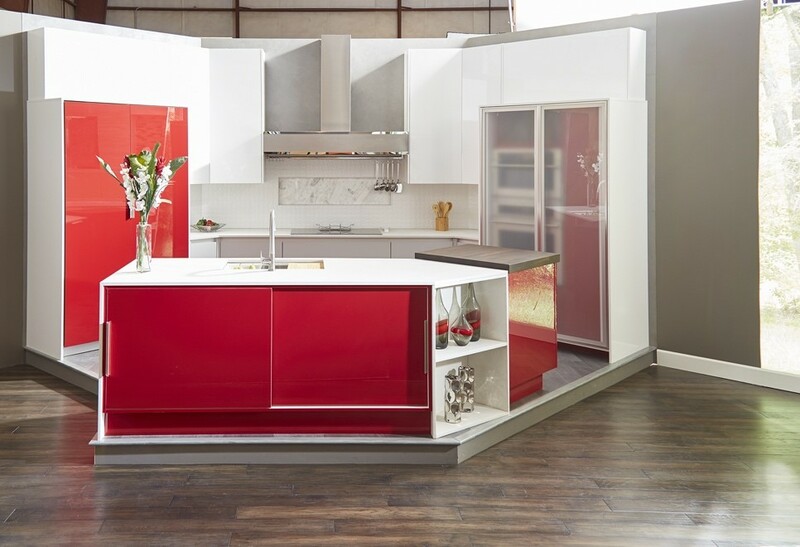 Wellborn Cabinets displayed their array of colorful offerings in a beautifully designed, state-of-the-art kitchen featuring sleek white cabinets nestled in between tall, bold red wall cabinets and an angular kitchen island. 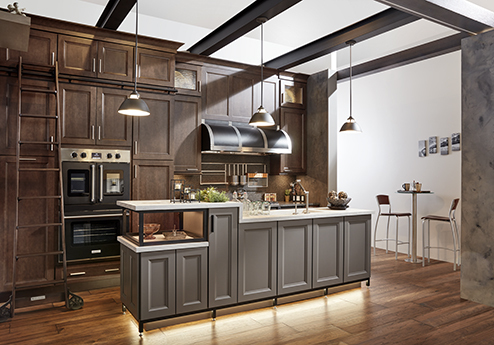 Matte black was an elegant addition to several beautiful kitchen designs and styles this year. 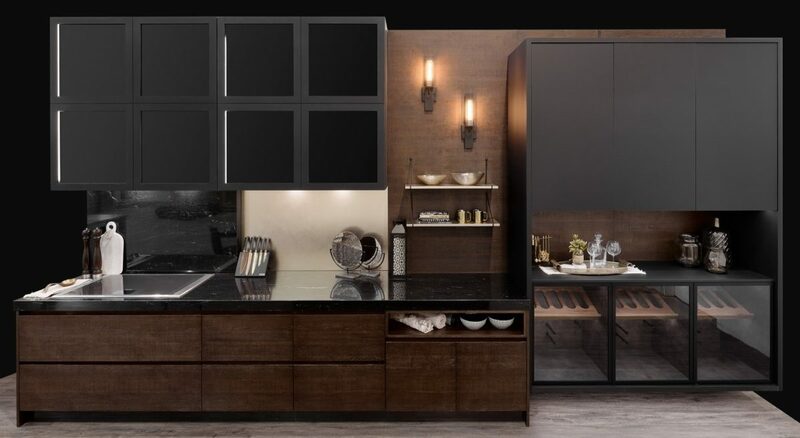 Cabico’s Felix kitchen was an elegant interpretation of dark, dramatic cabinetry. The black matte surfaces of the cabinets were accentuated by dark wood base cabinetry and glass fronts with black matte frames highlighting beautifully finished cabinet interiors in the wine bar. DesignCraft’s industrial kitchen featured light shaker style cabinetry juxtaposed with black matte upper cabinets. The black matte finish carried through to the open shelving and decorative hardware on the bright red wall cabinets. 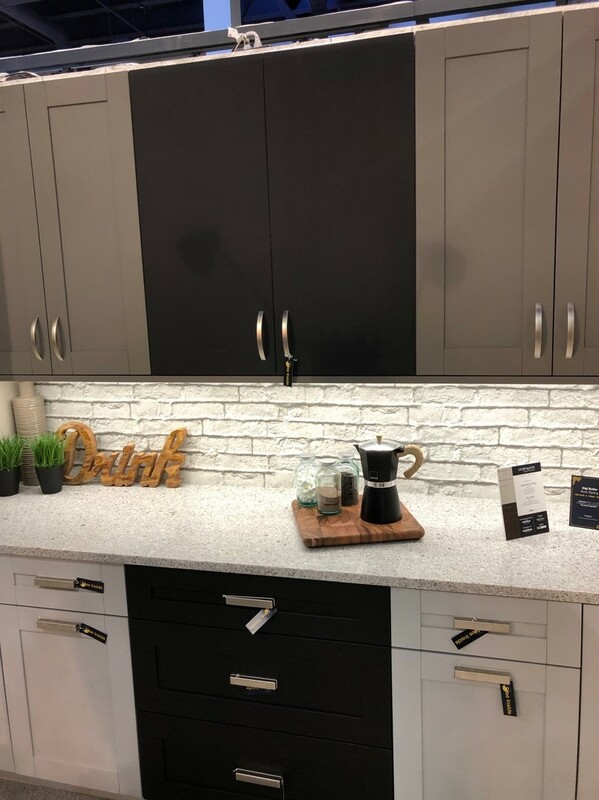 Matte black finishes are versatile enough to pair with different door styles and colors as seen in the Serenade Cabinetry display. The old rules of color, material, and finishes are out the door. The new rules combine materials and products for a style that’s one-of-a-kind. 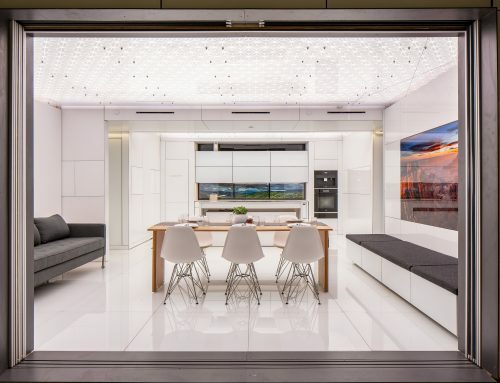 The Designcraft Metro Contemporary kitchen combines high gloss white cabinetry with matte silver backpainted glass doors and light gray base cabinetry that surround a stunning tile backplash for a true reflection of personal style. 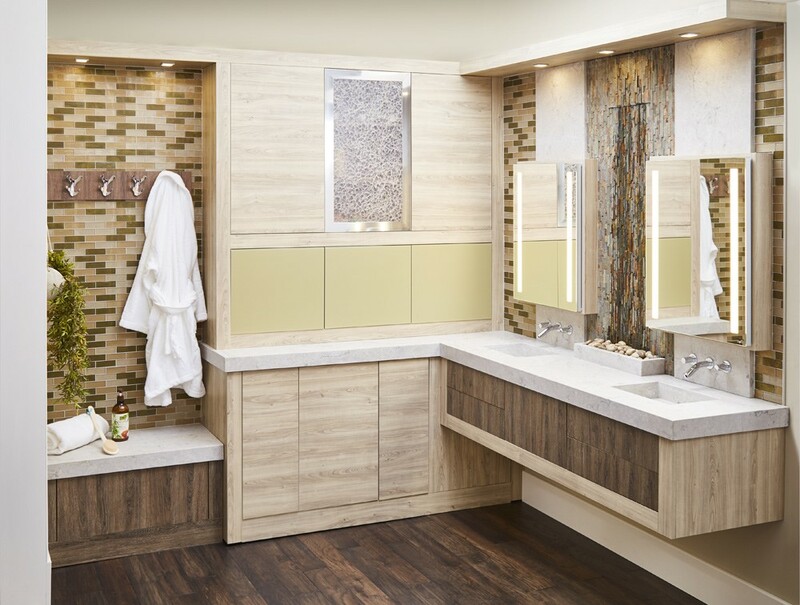 Wellborn Cabinets combined sleek cabinetry featuring warm wood tones, pale green backpainted glass doors, organic inserts, accent lighting and metallic finishes to create a calming, spa-like retreat. 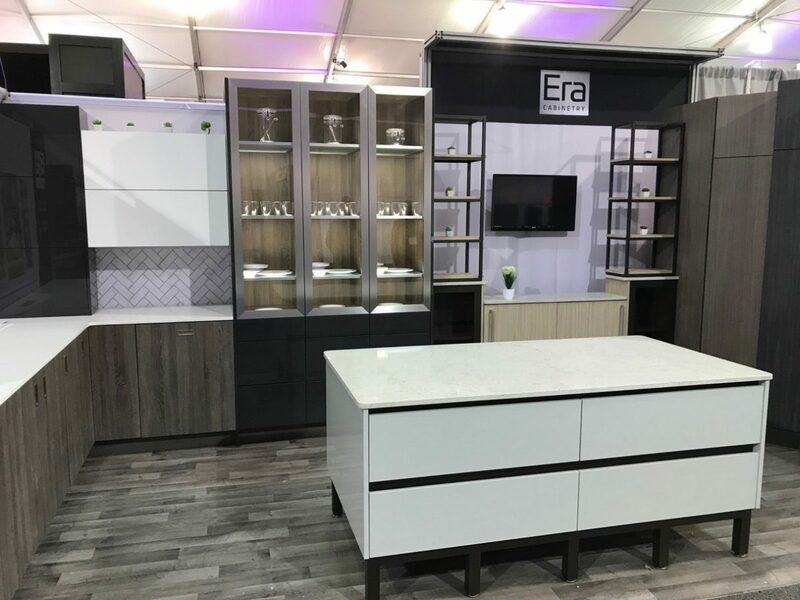 Era Cabinetry’s new European inspired cabinetry line speaks to modern design trends, combining different cabinet colors, stainless steel framed glass doors and open shelving to form a truly personalized kitchen space. 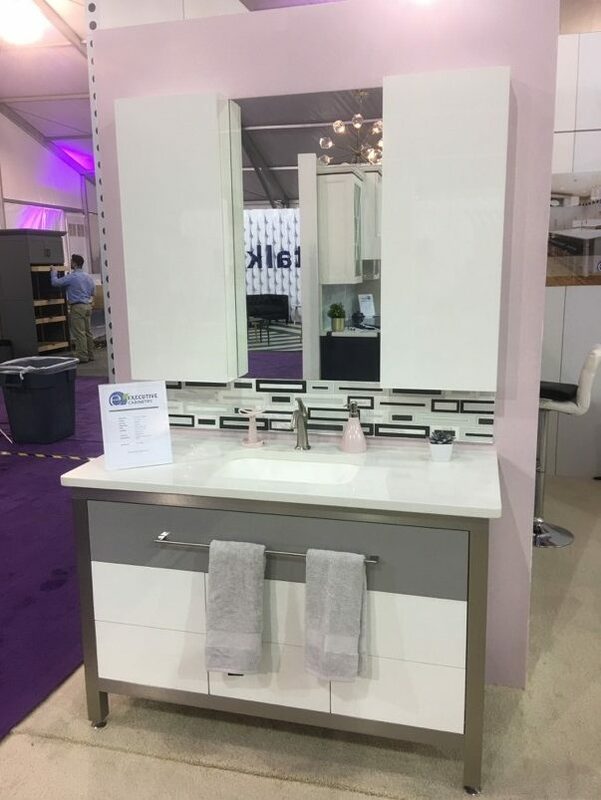 This bathroom vanity by Executive Cabinetry is grounded by a stainless steel frame which surrounds neutral gray and high gloss acrylic white drawer fronts and upper cabinetry. The vanity is accented with geometric tile to create a light modern space. Illumination is a critical part of both kitchen and bathroom design, and this year’s trends introduced innovative approaches to incorporate lighting in a space. 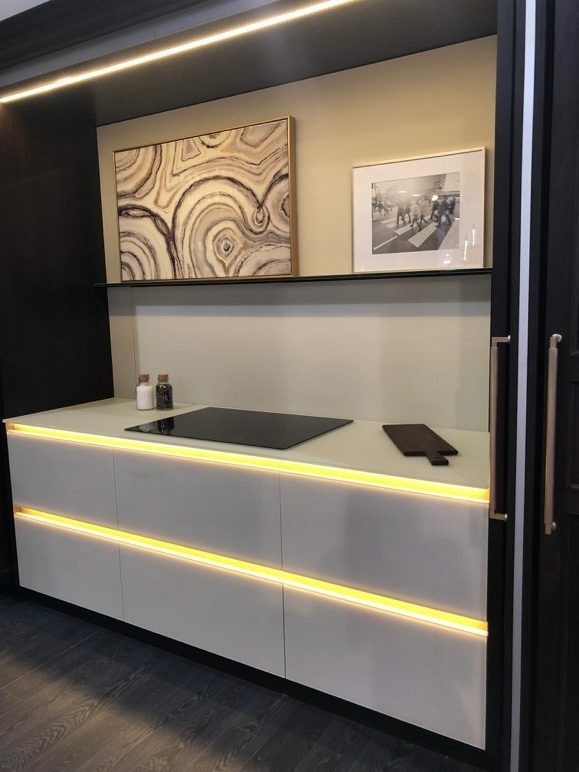 Plato Woodwork’s modern white kitchen incorporated matte backpainted glass surfaces, soft gold finishes and striking illuminated channels in lieu of decorative hardware. 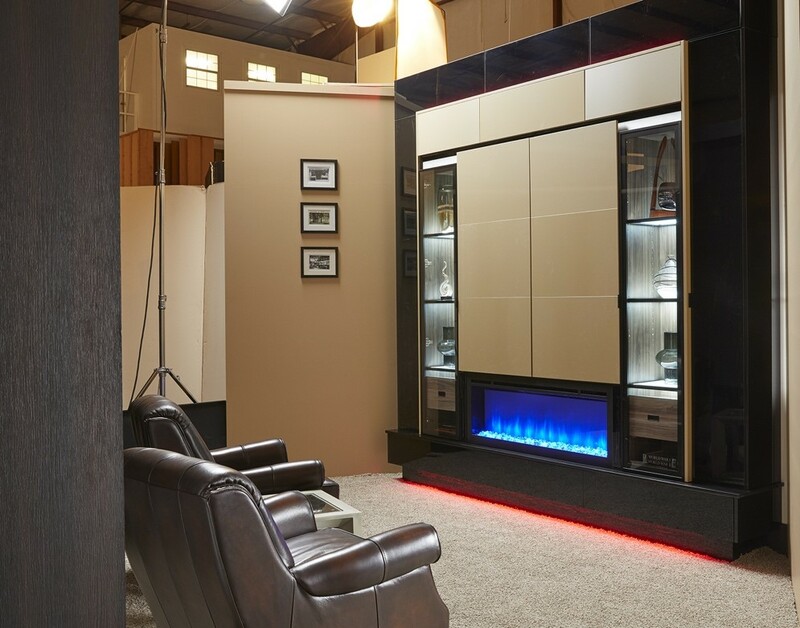 Wellborn Cabinets made a statement with their media room storage cabinetry solution. The display cabinets featured elegant illuminated shelving while base accent lighting adds a pop of color to set the mood. In the next year and beyond, these trends will be showcased in kitchens and bathrooms everywhere. 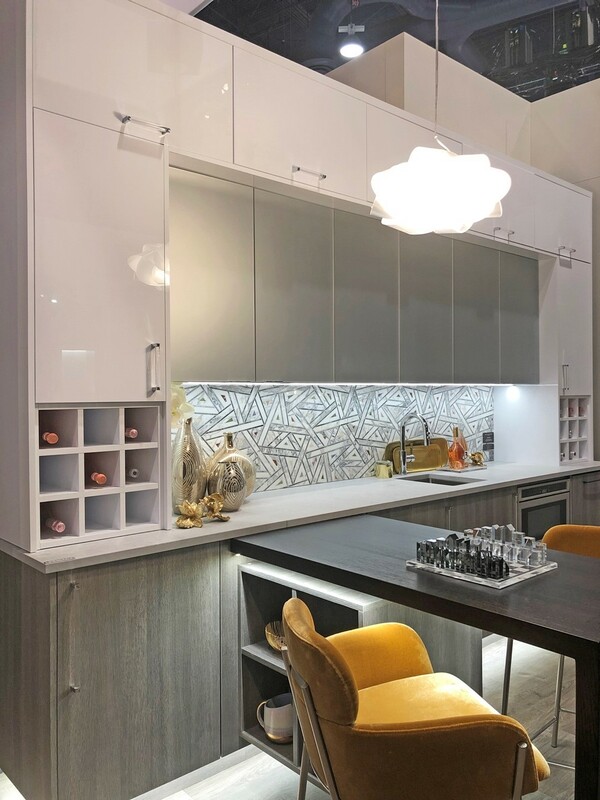 Incorporating 2019’s design trends with Element Designs architectural casework components can transform and elevate spaces. 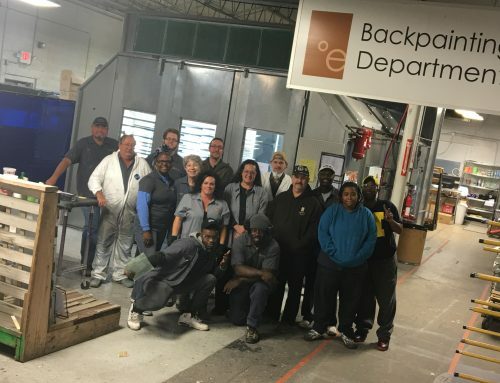 Element Designs offers custom, contemporary cabinet doors, sliding door systems, and surfacing products made of aluminum, glass, and acrylic. 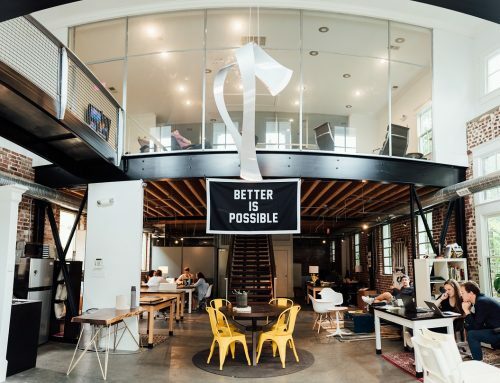 Contact any of our customers featured in this blog post or get in touch with us directly to find out how to include Element Designs products in your next project. 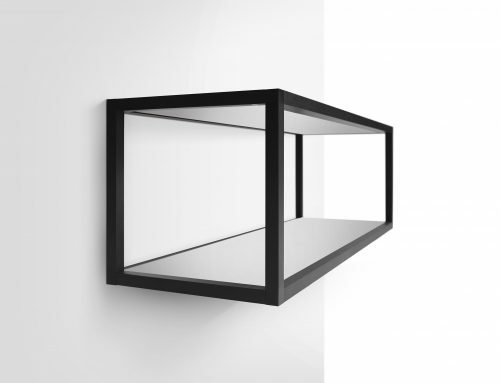 Visit our website where you can design your own aluminum frame cabinet door today.